The crisis in East Pakistan produced new strains in Pakistan's troubled relations with India. The two nations had fought a war in 1965, mainly in the west, but the refugee pressure in India in the fall of 1971 produced new tensions in the east. Indian sympathies lay with East Pakistan, and in November, India intervened on the side of the Bangladeshis. 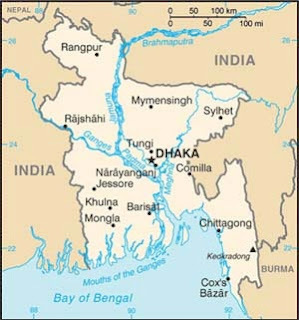 On December 16, 1971, Pakistani forces surrendered, and Bangladesh--meaning "Bengal country"--was born; the new country became a parliamentary democracy under a 1972 constitution. Prime Minister Hasina has sought to increase Bangladesh’s presence on the world stage. As leader of one of the countries most vulnerable to climate change, Hasina has been a vocal advocate for mitigation and adaptation by both developed and developing countries, aligning with the Copenhagen Accord in January 2010. In a sharp change from previous administrations, her government has actively confronted violent extremist groups to deny space to terrorist networks and activities within its borders. The simultaneous elections of the Awami League and the Congress Party in India set the stage for renewed bilateral talks between the countries, an atmosphere which has been improved by counterterrorism cooperation. In January 2010, Hasina traveled to New Delhi to meet with Indian Prime Minister Singh, where they signed three agreements on mutual legal assistance in criminal matters, transfer of sentenced persons, and countering terrorism, organized crime, and illegal drug trafficking; and two memoranda of understanding on energy sharing and cultural exchange programs. Since independence in 1971, Bangladesh has received more than $30 billion in grant aid and loan commitments from foreign donors, about $15 billion of which has been disbursed. Major donors include the World Bank, the Asian Development Bank, the UN Development Program, the United States, Japan, Saudi Arabia, and west European countries. Bangladesh historically has run a large trade deficit, financed largely through aid receipts and remittances from workers overseas. Foreign reserves dropped markedly in 2001 but stabilized in the $3 billion to $4 billion range (or about 3 months' import cover). In January 2007, reserves stood at $3.74 billion, and they increased to $5.39 billion by January 2008, according to the Bank of Bangladesh, the central bank. As of FY 2009, Bangladesh’s economy was weathering the global economic crisis, growing some 5.9%. Exports dipped slightly, but the decrease was modest compared to other developing nations. Remittances from overseas workers remained strong, though it was thought that growth in remittances could slow following an apparent slowdown in the numbers of Bangladesh workers going abroad. The United States is Bangladesh’s third-largest export market, with trade between the two nations reaching $4.2 billion in 2009. The economy was predicted to grow near 6% in 2010. Since 1975, Bangladesh has sought close relations with other Islamic states and a role among moderate members of the Organization of Islamic Cooperation (OIC). In 1983, Bangladesh hosted the foreign ministers meeting of the OIC. The government also has pursued the expansion of cooperation among the nations of South Asia, bringing the process--an initiative of former President Ziaur Rahman--through its earliest, most tentative stages to the formal inauguration of the South Asian Association for Regional Cooperation (SAARC) at a summit gathering of South Asian leaders in Dhaka in December 1985. Bangladesh hosted the SAARC summit in November 2005, and Prime Minister Khaleda Zia reassumed its chairmanship. Bangladesh has participated in a wide range of ongoing SAARC regional activities. The head of the then-caretaker government participated in the April 2007 SAARC summit in India. The BNP and other political parties view the Indian Government as a major benefactor of the Awami League and blame negative international media coverage of Bangladesh on alleged Indian manipulation. Former Prime Minister Khaleda Zia, however, visited the Indian capital in March 2006 and reviewed bilateral relations with her Indian counterpart. Two agreements--the Revised Trade Agreement and the Agreement on Mutual Cooperation for Preventing Illicit Drug Trafficking in Narcotic Drugs and Psychotropic Substances and Related Matters--were signed between the two countries during this visit. Indian Foreign Minister Pranab Mukherjee met with the Chief Adviser in Dhaka on February 26, 2007. Mukherjee invited Ahmed to the April 3-4, 2007, SAARC summit in Delhi, and both sides pledged to put Bangladesh-India relations on "an irreversible higher trajectory." Mukherjee again visited Bangladesh after Cyclone Sidr hit the southwestern coastal districts on November 15, 2007 and offered help to rebuild 10 of the devastated villages. Bangladesh Army Chief General Moeen U. Ahmed paid a 6-day visit to India beginning late February 2008 at the invitation of his Indian counterpart. He met with Mukherjee and the Chief Minister of West Bengal province, besides meeting military officials. During this visit, Ahmed announced that passenger trains could start running between Dhaka and Kolkata by April 14. In 1989, the U.S.S.R. ranked 14th among aid donors to Bangladesh. The Soviets focused on the development of electrical power, natural gas and oil, and maintained active cultural relations with Bangladesh. They financed the Ghorasal thermal power station--the largest in Bangladesh. Russia conducted an aggressive military sales effort in Dhaka and won a $124-million deal for eight MIG-29 fighters. Bangladesh began to open diplomatic relations with the newly independent Central Asian states in 1992. Bangladesh has signed an agreement with Russia for the construction of a nuclear power plant, and Foreign Minister Dipu Moni visited Moscow in May 2010. In March 2010, Prime Minister Hasina visited China, in an effort to strengthen the countries’ diplomatic ties and discuss regional and global issues. Bangladesh agreed to continue its embrace of a “one China” policy, and China in return pledged significant development aid to Bangladesh. China also agreed to provide financing for several new infrastructure projects in Bangladesh. Since 1986, with the exception of 1988-89, when an aircraft purchase made the trade balance even, the U.S. trade balance with Bangladesh has been negative, due largely to growing imports of ready-made garments. Jute carpet backing is the other major U.S. import from Bangladesh. Total imports from Bangladesh were about $2.6 billion (excluding services) in FY 2005, up from $2.1 billion in 2002. In 2007 total imports reached $3.4 billion. U.S. exports to Bangladesh (some $333 million--excluding services--in 2005, and $456 million in 2007) include wheat, fertilizer, cotton, communications equipment, aircraft, and medical supplies, a portion of which is financed by the U.S. Agency for International Development (USAID). A bilateral investment treaty was signed in 1989. Additionally, Bangladesh has become a valuable United States ally in global efforts to defeat terrorism. As part of these efforts, the Government of Bangladesh has begun to address problems of money laundering and weak border controls to ensure that Bangladesh does not become a terrorist safe-haven. Despite porous borders, ungoverned spaces, and poor service delivery, Bangladesh’s strong national identity and moderate Islamic tradition help it serve as a key player in combating extremism.